Find out what our experts have to say about Thunderbird LT! The least priced variant is Triumph Thunderbird Storm priced at Rs. 16,14,410 and the most priced variant is Triumph Thunderbird LT priced at Rs. 18,74,801. Choose the Thunderbird LT which fits the bill of you. Triumph is known to make world class cruisers which look conventional but feel very modern to ride, just like the Thunderbird Storm. The Thunderbird Storm looks and feels exactly like its name. It’s massive, has enough chrome and all the characteristics of a power cruiser. It has the right silhouette, the right visual bulk, and enough street presence to attract all sorts of eyeballs. The center console houses the instrument cluster that has analogue speedometer featuring integrated rev counter, LCD trip computer, fuel gauge and clock too. The LCD trip computer functions can be accessed by the scroll button on handlebars. 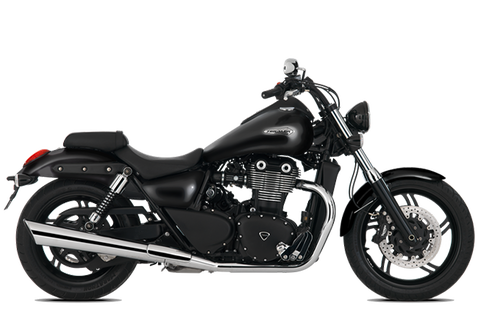 The Triumph Thunderbird Storm comes in 2 colours - Jet Black and Lava Red. The Jet Black Thunderbird Storm retails for Rs.14,45,500 (Ex-showroom, Delhi) while the Lava Red colour retails for Rs.14,67,500 (Ex-showroom, Delhi). The Thunderbird Storm competes with the likes of Harley Davidson and Indian motorcycles. If you want a bike that looks good and has an unavoidable presence on the road, the Triumph Thunderbird Storm is the bike for you. It is a fine piece of British engineering with a beautiful yet contemporary design. The twin headlamps will grab your attention first, which look similar to the elder sibling, the Triumph Rocket III. The huge shiny tank of 22-litre capacity complements the bulky cruiser design. The seats are wide and plush on the Thunderbird Storm to provide the rider with a comfortable ride. While chrome is used decently on the mirrors and the exhaust pipes; the engine, headlights and the alloy wheels are all blacked out. On the center console is a classic speedometer, fuel gauge and a LCD screen. Distance to empty, odometer and a clock is featured on the the LCD screen inside the center console. Strong yet beautiful, the Triumph Thunderbird Storm’s design really complements its huge engine. This 1699cc, liquid-cooled, DOHC, parallel-twin 270º firing interval engine pulls so hard that you can easily achieve triple digit speed within a few seconds. It has a max power of 98PS at 5,200rpm and a colossal 156Nm of torque which is delivered at as low as 2,950rpm. The engine uses the multipoint sequential electronic fuel injection and progressive linkage on throttle system. The six speed transmission available on the Thunderbird Storm is smooth but the clutch is very heavy to operate easily. Manufacturer claims a fuel consumption of 17.3 - 23.6kmpl on the highway. The parallel-twin engine simply transforms this beast into a smooth cruising machine on the long stretches. Triumph Thunderbird Storm despite weighing 300kgs is not at all intimidating and very easy to maneuver. This is mainly due to the metzeler tyres on the bike and adjustable rear suspension on the back. The Thunderbird Storm has 19-inch, 5-spoke cast aluminium alloy wheel covered by 120/70 R19 Metzeler tyre at the front while the rear gets a 17-inch 5-spoke cast aluminium alloy wheel covered by 200/50 R17 75W Metzeler tyre. The seat is very plush and comfortable both for the rider as well as the pillion. Besides the traditional design and relaxed riding position the bike feels very aggressive. Ride on this bike feels very supple with the 120mm travel Showa 47mm forks at the front and a 95mm rear wheel travel Showa black spring twin shocks with 5 position adjustable preload at the back. You might scrap the underbelly with some high speed breakers in India as the ground clearance is low. Braking duties on the Thunderbird Storm are taken care by twin 310mm floating discs with Nissin 4-piston fixed calipers at the front and single 310mm fixed disc with Brembo 2-piston floating caliper at the back. With Antilock Braking System (ABS) as standard on both the wheels, stopping the heavy bike feels very safe and secure. Anti-Lock Braking System (ABS) is standard across the Thunderbird series, which is also expected from a bike in this price range. One can customize the bike according to specific requirements. Some of the add ons include Leather panniers, silencer kit, footboard kit, luggage rack and dresser bars.